When we turn on a light or check the weather forecast, we are reaping the practical benefits of physics research. As well as exploring fundamental science, this BSc goes to the cutting edge of technologies that affect everyday life, equipping you with the tools and imagination to address tomorrow's questions. A total of 17 points in three higher level subjects including Mathematics and Physics at grade 6, with no score below 5. D3,D3,D3 in three Cambridge Pre-U Principal Subjects, including Mathematics and Physics. Successful completion of the WBQ Advanced Skills Challenge Certificate plus 2 GCE A-Levels at grades AAA, including Mathematics and Physics. Core modules in the first year provide a firm foundation in quantum and classical physics, underpinned by mathematics and a practical skills course which includes computing skills training. The second year includes core modules in quantum physics and its application to atoms and molecules, statistical thermodynamics, electromagnetic theory and further mathematics. The quantum and condensed matter elements of the core are completed in the third year. The second and third years also include practical laboratory and project modules, and optional modules to develop further and enhance knowledge of a range of physics topics. Assessment will normally involve end-of-year examinations, and an element of assessed coursework. For practical work you will be continuously assessed. 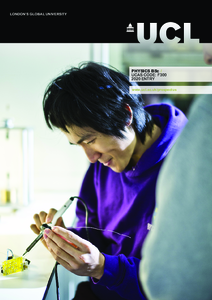 Detailed course descriptions are available on the department website: Physics BSc. Your scientific training will equip you with an understanding of mathematics, and of physical principles and techniques, as well as transferable skills in analysis, rational argument and innovative problem solving. Surveys by the IOP indicate that physicists' versatility is valued in a vast range of careers.